This is my first attempt at a children’s picture book story – very much a first draft, but lots of fun. It’s dedicated to M, J, T, M and K.
The Peacock family lived on a little farm called Paradise. 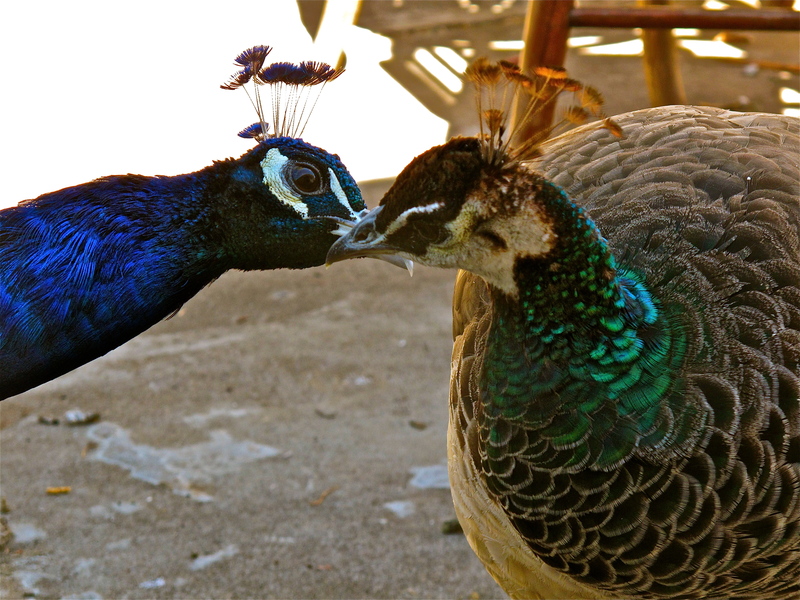 Daddy Peacock’s name was King because he had the most powerful beak in the world. 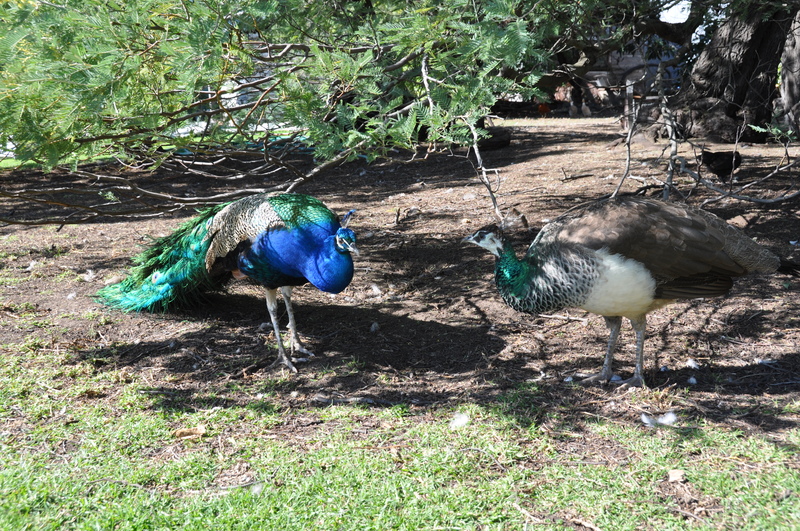 Mummy Peahen’s name was Queenie. King and Queenie loved each other very much. 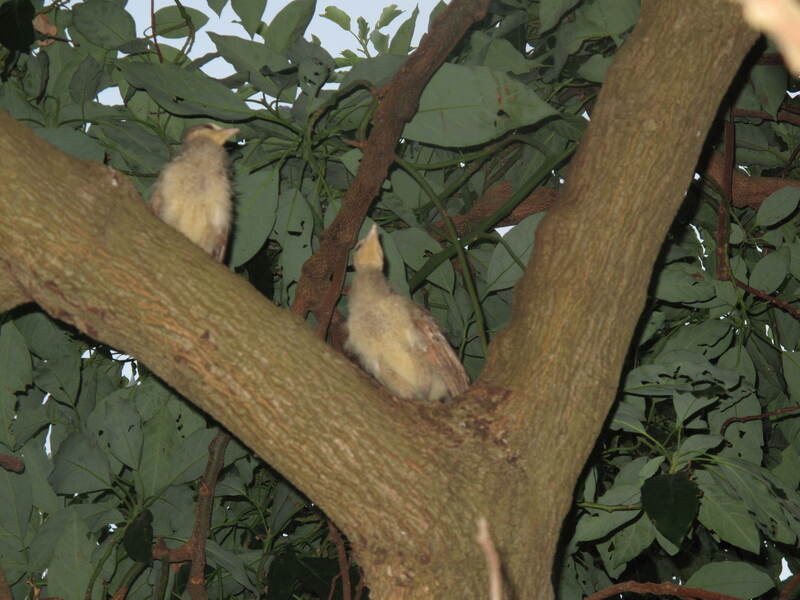 King and Queenie eventually had three peachicks: a little girl called True, and the twins, Kungfu and Mischief. 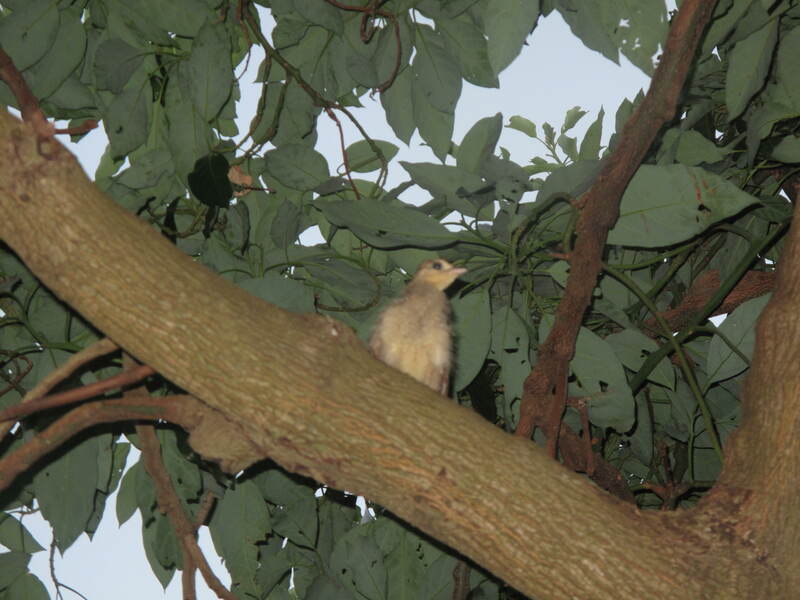 When they were little, Queenie would organize tree-climbing competitions. She would fly to the top of the huge avocado tree and say, ‘ready, set, go!’ True always won because she was the biggest. The twins, Kungfu and Mischief, tried their best but they could never beat True to the top of the tree. Sometimes they all fell down to the ground but they never hurt themselves because Queenie showed them how to use their wings like parachutes. True already knew she had wings so, when Queenie was having her afternoon nap, True showed her little sister and brother how to fly. When Kungfu learned to fly, he was so happy he flew straight into his dad’s feathers – BANG. 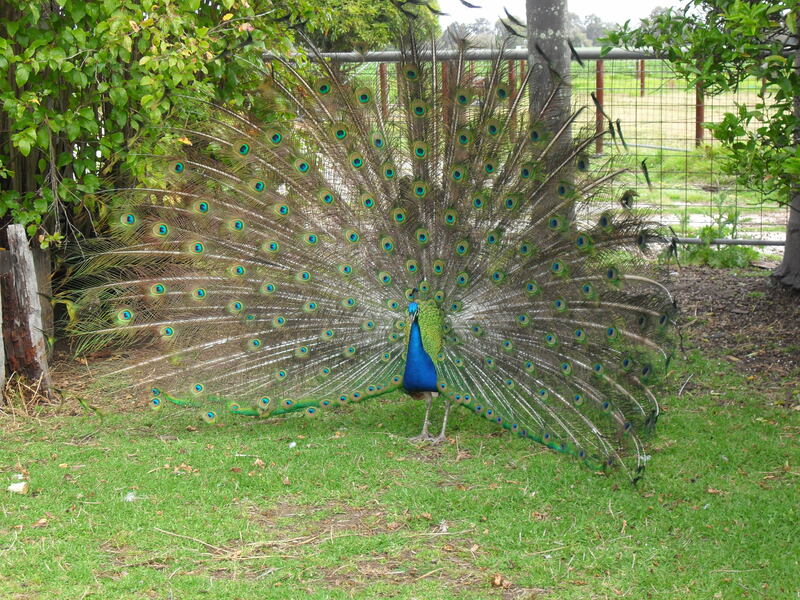 But King didn’t mind at all because he had plenty of feathers and he loved to show them off. Mischief was very good at tricks. She would sometimes pretend to fall out of the tree so that King would have to catch her. But King wasn’t fooled. He would play hide-and-seek with Mischief until she gave up and called ‘Daddy”. Then he would say BOO! 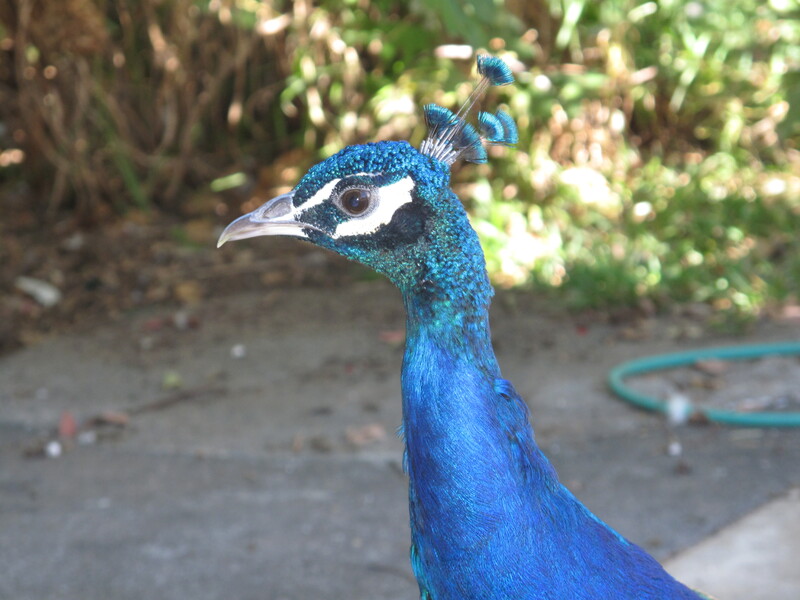 Kungfu was the first peachick to grow feathers and every day he practised doing what his dad did. It was very hard to begin with but one day, he did it! 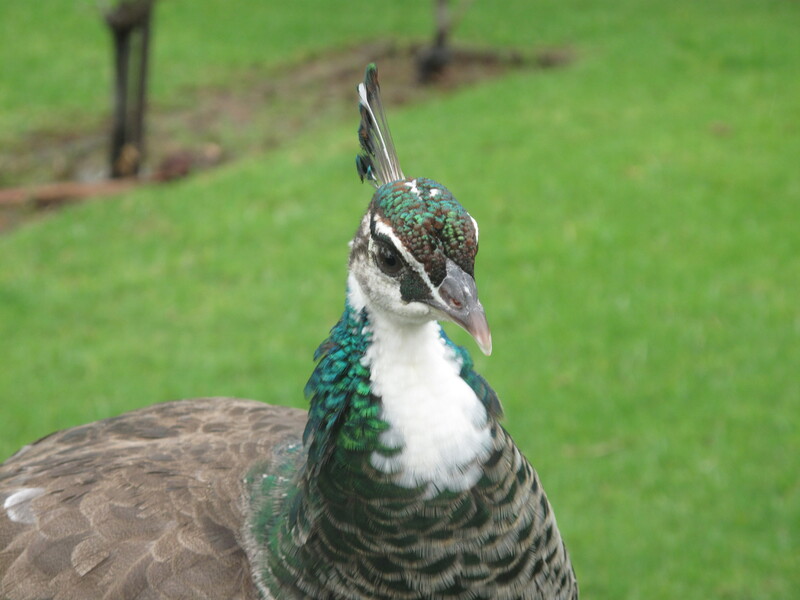 But True, being such a truthful peahen, would say, “Kungfu, you look ridiculous!” Then they would have an argument and Mischief would laugh and laugh and laugh, but very quietly. 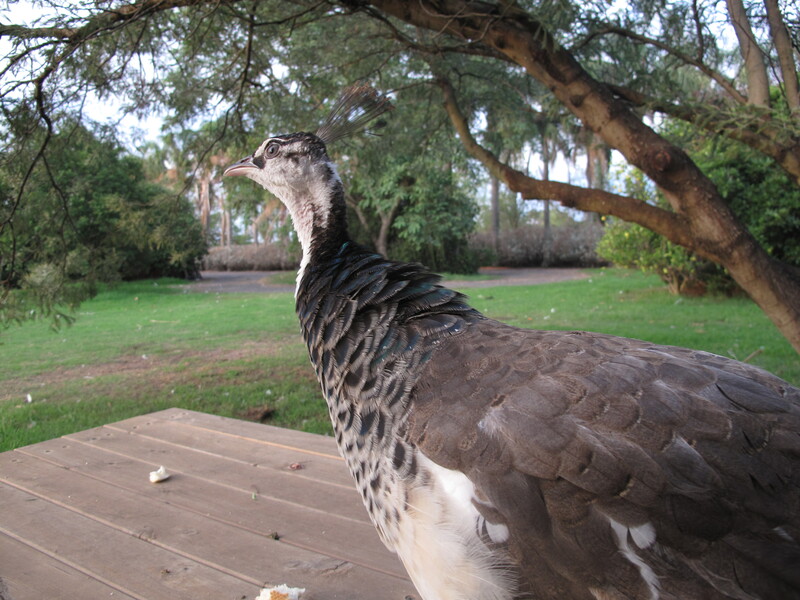 Mischief, being such a mischievous peahen, knew exactly how to laugh without looking like she was laughing. After all, she didn’t want to hurt Kungfu‘s feelings. But Kungfu always knew when Mischief was laughing at him so he would wait until she was looking at her reflection in the pond and WHAMMO he would bite her big toes – both of them. King and Queenie decided that they needed to talk to their children about their behaviour. “Do you think Mischief is a bit too mischievous, Darling?” asked Queenie. “No, Sweetie-pie. She’s just growing up. I’m more worried that she will fall into her reflection in the pond,” said King. “Yes, I’ll talk to her about that. What about True – do you think she is a bit too truthful, Darling?” asked Queenie. “Yes and no. She really needs to stop pushing Kungfu‘s buttons,” said King, wisely. “How can we stop Kungfu from biting Mischief‘s toes?” asked Queenie. King thought for a moment. 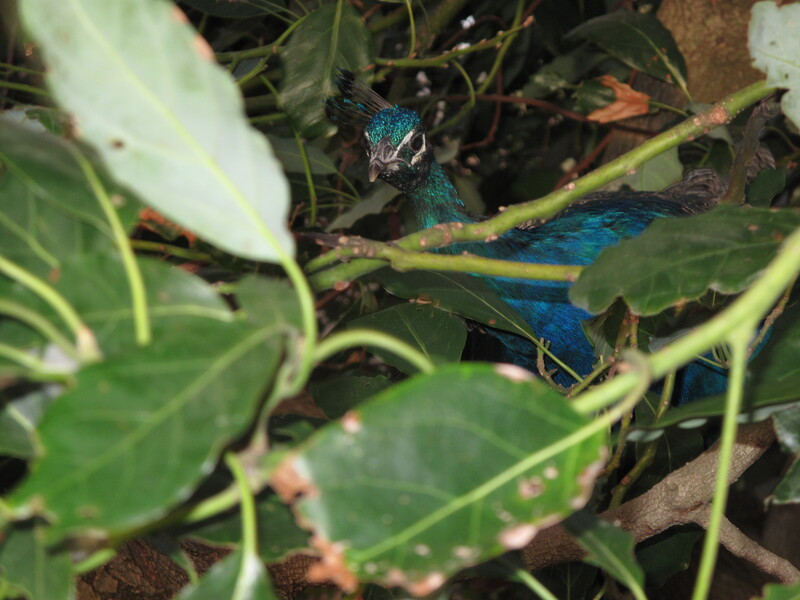 That night, as the Peacock Family settled down for the night, high up in the avocado tree, True waited until everyone was asleep, then she asked the sky. 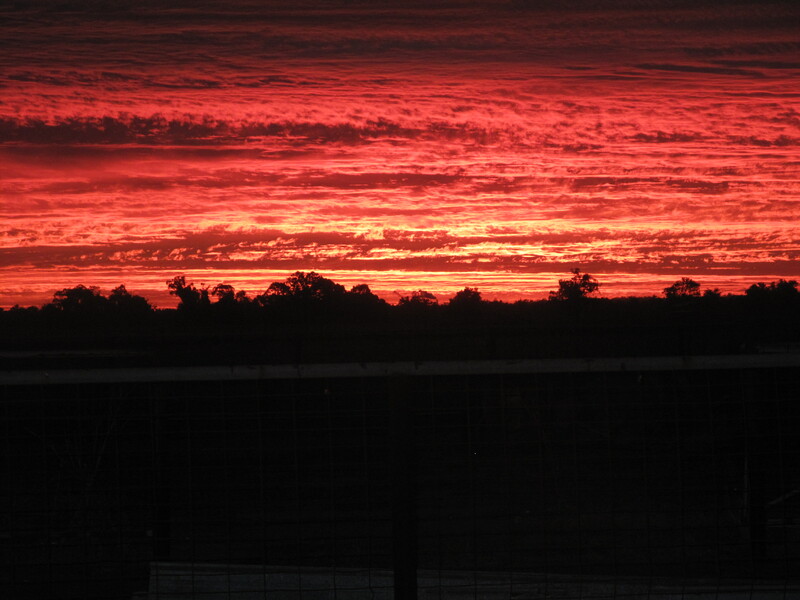 And the big, red, pink, orange, yellow, beautiful sky answered her. Then, all of a sudden, Kungfu turned over in his sleep and accidentally kicked True off her branch. I am very much a beginner with this kind of writing but it’s fun! Absolutely gorgeous – love it! I have always wanted to write a children’s picture book but it’s harder than writing a novel! Well I am waiting to see the next installment. 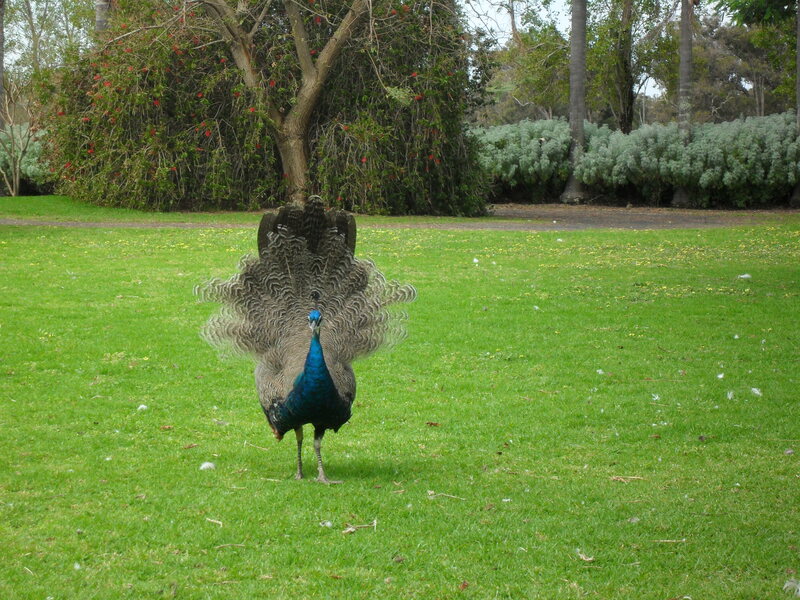 You are SOOOOO lucky having all those gorgeous peacocks in your backyard. I think every child in town would probably like to visit – just as long as King spread his tail for all to see. Don’t forget to take some photos of King from the back. I love the rear side of peacock feathers. I tried to put one of mine in this comment but I don’t think it worked. What a lovely idea, I look forward to the next installment. I have never written for children before so this is just a very rough first draft – am having fun though. Thanks Susan. You mean there is suspense? – yay! Lovely – especially the illustrations! Apparently I need an illustrator – photos just won’t do! I love it! well done. Thos photos are fabulous too! Just a bit of fun today I guess – but you never know, I might be able to do this – who knows? Okay – thanks for the encouragement! Loving it – when’s the next instalment? Oh no – pressure is on haha! It’s such a rough draft – thanks for the !!!! Wonderful story and pictures! Interesting and engaging. Not a lot of books (that I know of) from the peacock perspective. Love the cliff hanger. More important kids will love the cliff hanger. I need to research the whole picture book thing. I’ll do my best hehe! Wonderful photos. Writerly names. So cleverly descriptive. A bit of an experiment – thanks Tracy! That is cute.interesting. Good photos, sometimes you need to change your point of view to eliminate distractions in the back ground , i.e. the hose, etc. or get someone to edit them out for you on lightroom or Photoshop, etc. Keep it up, Julie. Great advice – thank you Jane! I think you’ve got a cute story started here. One that most kids would enjoy. What age group are you aiming at? Around 5 years old do you think? Not sure. Yes I might have to split it into a few stories haha! Thanks for the feedback – I am quite enthused about the idea now. I fell in love with the color of the photos and the words. Lessons to learn for children and very enjoying and easy reading. I am ready for the next part!!!!! Thanks and so glad you like it! I could see this as a kid’s picture book. Great job!